The Saab Owners Club actively supports owners of Saab 95 and 96 V4s. The V4 was Saab’s first 4-stroke engine, but it was actually made by Ford in Germany. The "Cologne" V4 used in the Taunus 12M, 15M and 17M is quite different to and more reliable than the "Essex" V4 from the Zephyr/Zodiac and Transit that is more familiar to the average British driver. It replaced the two strokes in the mid 60s and carried on in production until 1980. A rugged, torquey engine, it gained a reputation for reliability, longevity and performance – helped of course by Saab’s rallying successes. 96V4s won the RAC rally in 1968 and 1971, among many other international successes. Many members still actively Rally in their competition V4s in classic, historic and post-historic classes. See the Motorsport section for more information about the Competition cars still being campaigned by members. The majority of members still prefer to use their V4s as road cars, many still in regular everyday use. As you would expect, we have members with cars from all ends of the spectrum – from beautifully restored concourse cars, modified and customised cars to regular, every-day cars and restoration projects. There are still a few in original condition, unrestored and looking pretty much as they left the showroom. The V4 remains a special car in Saab’s legacy. 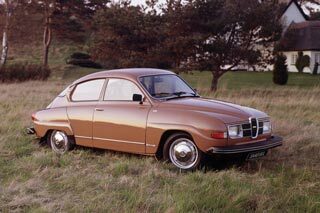 It drove Saab into new markets and helped to boost sales around the world. For many people today, the quirky V4, whether a beetle-backed 96 or the more “unusual” form of the 95 7-seater estate, is their earliest memory of a Saab. Thankfully in recent years the Saab V4 is beginning to appreciate in value - it has always lagged behind its more commonplace or more glamorous contemporaries. Nowadays, a project car will cost between £400 and £1000, good usable roadworthy cars from £1500-2000 upwards and really mint examples are selling for over £5000. Most parts are still widely available. The main factors to consider when buying a V4 is condition of the bodywork, as while they were well protected from new, the latest of these cars are now 40 years old and the oldest 50+. We are also fortunate to have a good number of specialists throughout the UK who can help with jobs from servicing to major restorations. People like Graham MacDonald (MacDonald Classic Cars), Martin Bayfield (Jamsaab), Mark Ashton (MSA Autobodies), Steve Broadhead (Malbrad) and Nick Senecal (Saab Doctor). In addition to trying to keep a record of the remaining population of these wonderful cars, the V4 Register aims to provide support to V4 owners in the form of advice, guidance, help finding parts suppliers, sourcing V4s and selling them. Increasingly we are also asked to become involved in projects to remanufacture rare or obsolete parts. Recently we helped arrange the manufacture of a batch of laminated windscreens for the V4 community. Our V4 Registrar and former Vice-Chairman of the Club, Alistair Philpott, is a life-long Saab enthusiast and fan of the V4 . He owned 2 V4s before he even gained a driving licence and has owned & run many in the 30 years since. Alistair lives in North Yorkshire and currently owns a highly modified 400bhp 9-5 Aero, a share in a C900 T16s Trackday car, and for the next few years will be caretaker for his daughters' two 96V4s: A 1971 96V4 for daughter #1 and a 1975 Silver Jubilee 96V4 for daughter #2, as donated by proud Grandad and former SOC Chairman (twice! ), Mike Philpott. Thanks to an idea kicked off by another SOC member, Andy Deans, Alistair managed the marketing and production of a batch of laminated windscreens for V4s. By harnessing the buying power of many SOC members, the unit cost of a batch of 20 screens was reduced massively compared with a one-off remanufacturing process. In future, this type of spares and remanufacturing support for members driving older Saabs is something he would like to see the SOC take a far more active role in achieving. Should any V4 owner need a laminated screen for their car (post-68 high screen only I'm afraid), our friends at MALBRAD in Huddersfield now have a small batch available. If you have any ideas or plans for parts remanufacture or "group-buy" initiatives that other V4 owners might appreciate, please get in touch with Alistair. Alistair will be happy to help you where he can, so don’t hesitate to get in touch if you have any V4 issues to resolve. It has proved that the clutch release fork shaft, which is carried on a bearing in the clutch cover, shows a tendency for labouring in its upper bearing or even getting stuck – due to corrosion. The result may be a slipping/damaged clutch. When working on the clutch or visiting a service garage, add a few drops of oil. At every 6,000 miles (10,000km) service inspection, lubricate the bearing with a few drops of oil. The end surface of the shaft lies somewhat lower than the surface of the clutch case, and in consequence the oil will remain in place until the bearing has been lubricated.